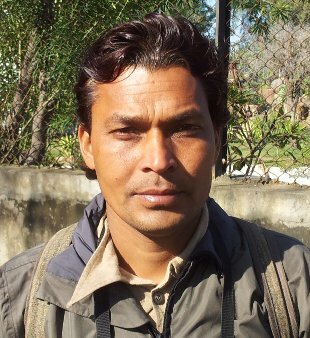 Sanjay Sharma is a bird-watching guide from Sultanpur village in Haryana, near the famous Sultanpur National Park, one of the best birding sites near Delhi. Being a resident of Sultanpur, Sanjay knows the area like the back of his hand. The active Delhi birding community usually finds out about the arrival of rarities from Sanjay (in 2013: Brown Shrike, Baikal Teal, Long-billed Dowitcher). Without him, the vast agricultural landscape outside Sultanpur and neighbouring villages would be largely unexplored. Sanjay also knows many other birding sites in the capital and further afield: e.g. Okhla Bird Sanctuary, Bhindawas in Haryana, Tal Chhapar Blackbuck Sanctuary in Rajasthan. He has many years of experience guiding bird-watchers visiting North India. The only thing better than Sultanpur is having Sanjay as your tour guide. He has a real talent for being able to find even the most rare and camouflaged birds. My boyfriend and I are also just starting to take pictures while birding, and he helped us a lot with finding the perfect light and angles. He is very informative, polite, and professional. This is an experience I will never forget. Thank you Sanjay so much! If I had more time in Delhi I would go birding with him again and again. Sanjay speaks both English and Hindi, and is available to guide both individuals and larger groups. Contact Sanjay about a birding trip at: sanjay@sanjay-birding.com or call him at +91-9812470521.